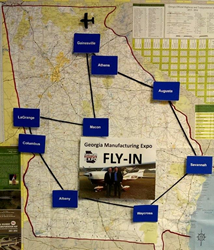 The Georgia Manufacturing Expo will conduct a special flight to more than a dozen state-wide destinations. 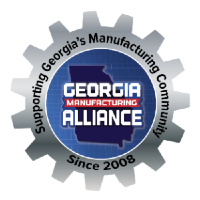 More than a dozen cities in just three days - that is what the Georgia Manufacturing Expo (GME) Fly-In tour will consist of. Jason Moss, founder of GME, Mike McGraw of McGraw Enterprises (pilot) and Brad Shumake of 4:TEN Media (videographer) will fly across Georgia touring manufacturing facilities and collecting nominations for the first ever Georgia Manufacturing EXPO Awards. Kicking off the Fly-In tour just one week following Manufacturing Appreciation Week, GME has planned an aggressive schedule for April 21-23. Moss plans to visit at least twelve manufacturing plants widespread across Georgia. The tour will begin Monday in Gainesville at Murray Plastics. Monday's agenda will close out in Savannah. Tuesday will conclude in Columbus and back to Gainesville late Wednesday.